At five-tonnes operating weight, the TB250 is currently Takeuchi's largest series-2 mini excavator, replacing the TB145 model. The TB250 features tough steel panels, flat glass and smooth, responsive controls combined with a much bigger cab. The heater system is located under the seat and the foot-well has been redesigned to give more legroom. The all-new door is mostly a single-piece flat glass panel with a steel handrail inside, offering clearer visibility to the nearside, better access to the cab, and cheaper replacement if needed. A revised instrument cluster sits in front of the right-hand joystick and features much clearer dials for water temperature and fuel level. There are audible warnings for low oil pressure and high coolant temperature. The front windscreen is gas-strut assisted and stows in the roof space when open, while the lower glass panel needs to be lifted out and secured behind the operator's seat. Air conditioning is optional. There is no sunblind to pull over the roof screen, rather a tinted glass panel. There is slightly more performance on offer for TB250 users, compared to the outgoing TB145. While both models use Yanmar's 4TNV88 water-cooled diesel engine, the TB250 develops 38hp at 2400rpm along with a broader spread of torque. These are marginal improvements from the 2185cc four-cylinder engine, and the cooling system now carries almost twice as much coolant. The revised cooling pack provides radiators that stand shoulder to shoulder for improved airflow. Cycle times are now better balanced between boom and arm movements too, says Takeuchi, though the 9.8 rpm slew speed is a smidge quicker than the 145. The cooling pack is accessed from a top-hinged panel on the right-hand side of the counterweight, giving plenty of space to clean the cores. Like others in the range, the 4TNV88 also features a fuel-saving auto idle function, which uses a step-motor to manage the cable-controlled throttle. 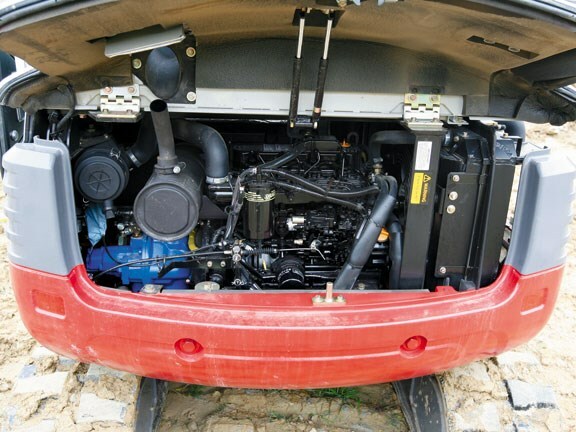 The Yanmar engine drives a quad-pump hydraulic system that uses two 58.3 litres/min variable displacement pumps and two gear pumps offering 38.9 and 3.4 litres respectively. There's less hydraulic oil in the machine too - 88 litres in the system compares to 110 litres in the old TB145. 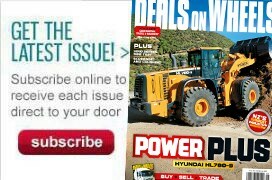 The engine is still located in the rear of the excavator, and an almost full-width engine cover that forms the upper part of the counterweight hinges upwards and creates generous access to the engine bay. The cab tilts forward to reveal the hydraulic lines and system. A plastic fuel tank - hidden beneath a lockable steel cover - is now fitted to eliminate condensation and possible contamination issues, while larger filters give better fuel filtering. The diesel tank also includes a sight-tube, which is visible when the front compartment is opened. There is now a pilot filter included within the hydraulic system and an integral tie-down point can be found in the rear frame too. 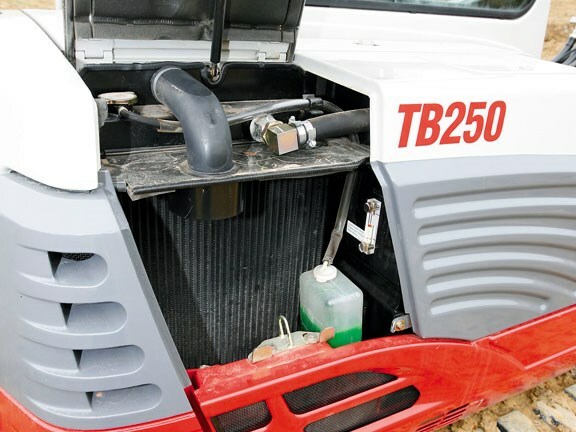 The TB250 weighs 150kg more than the TB145, but the overall footprint remains the same. Running gear continues to be five lower and one upper roller, all wrapped in 400mm rubber tracks. Tractive effort allows the TB250 to nip across site at speeds of up to 5.2kph. A load sensing system enables the track motors to automatically downshift when high-torque is needed on steeper climbs. It also keeps the same boom and arm configuration. The digging equipment allows a maximum digging depth of 3785mm from ground level, a maximum dump height of 4175mm and a maximum reach of 5995mm. 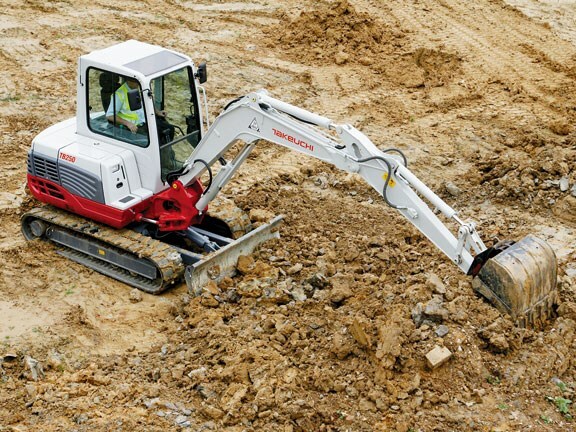 Takeuchi has developed a much deeper blade with a better curved profile that is said to offer better material retention, making this five tonner more accomplished for dozing. The extra weight helps to keep the machine more planted when excavating and it also contributes to better traction when dozing. 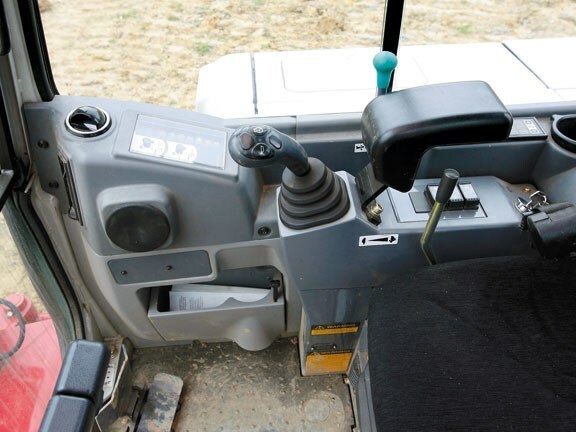 It's a no-frills machine with a basic interior, though it is much easier to get in and out of that slightly larger cab. Hard plastic surfaces offer a wipe-clean finish, and controls are simplistically laid out. Combined travel levers and foot pedals offer versatility when tracking. There are rocker-type foot pedals that are used for the double-acting auxiliary line and boom offset. A high-back seat offers good support and comfort. But the joystick pods are non-adjustable. The excavator feels strong, sure-footed and lively, but I'm soon slewing at a speed much faster than what the rest of the machine can keep up with. Boom lift feels a touch lazy and slew feels so lively, that I find myself constantly adjusting my inputs to maintain harmony. The heavy wet clay proves a suitable test and as I explore the machine's controllability and stability, there's little that phases the balance when the bucket is filled. And it's equally as stable at full reach over the side. You can provoke the five-tonner to dip down onto one track, but the reality is that you would have to make an effort to unbalance yourself. Repetitive tasks such a trenching is where this machine shows its mettle. And once settled into a rhythm of dig, slew and dump, the TB250 can soon open up a sizeable tract of ground. What I do find, is that the TB250 is yet another example of the current crop of machines that no longer needs the throttle wound fully open. There's plenty of torque available and easing back on the revs will bring fuel saving benefits without a loss of machine performance. 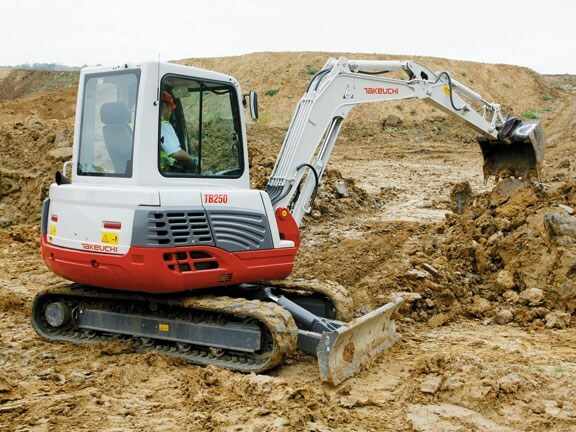 See a range of Takeuchi excavators for sale here.